Nose: Some fruits, vanilla and a balance between oak and more fruits. Palate: In the mouth, an elegant force, but smooth. A vanilla fragrance and balance between fruit and wood, typical of old Cognacs. The Francois Voyer XO Premier Cru Cognac is an one hundred percent Grande Champagne blend that has been aged beautifully. The eaux-de-vies contained within the blend are aged for three years in younger Limousin oak casks, then are transferred to older barrels in a humid cellar to continue the aging process. Using distillation with lees, the progressive reduction with distilled water is what makes this a fine Cognac. This is a technique that goes hand in hand with Voyer refinement and expertise. 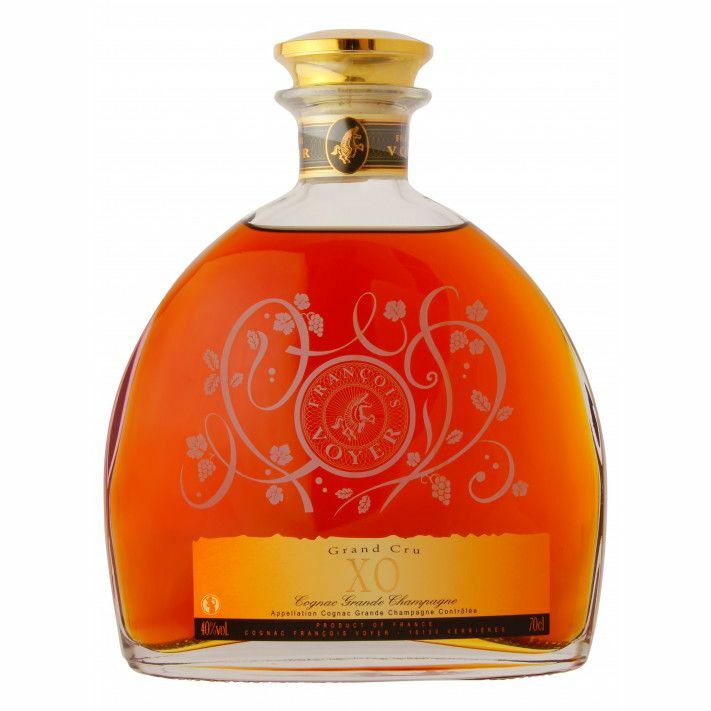 Falling into the Extra Old age category, the assemblage of eaux-de-vie in this Cognac are aged between 10 and 25 years old. It is named after the Premier Cru of the region for a reason; the special touch is that it is incredibly elegant in both taste and aroma. The subtlety is something that is rarely reached to such a degree. Despite its Grand Champagne status, it is an affordable blend that is marked by the pedigree of the land. For this reason, it is both highly enjoyable for first-timers to the Cognac world, and well-seasoned experts. The Francois Voyer (link to brand) Cognac maison is one that double distills their own artisanal produce, leaving a handmade touch on the process from start to finish. This is something carried out across all of their blends. A wide and curved decanter with golden details, the silver vine pattern etched across the bottle really illuminates its golden nectar. Enjoy it neat, or on the rocks. An after dinner must-have; the bouquet is one to be savored one you have sit back and relaxed.